Like me, Carolina Martinez is not orthodox about her musical tastes. 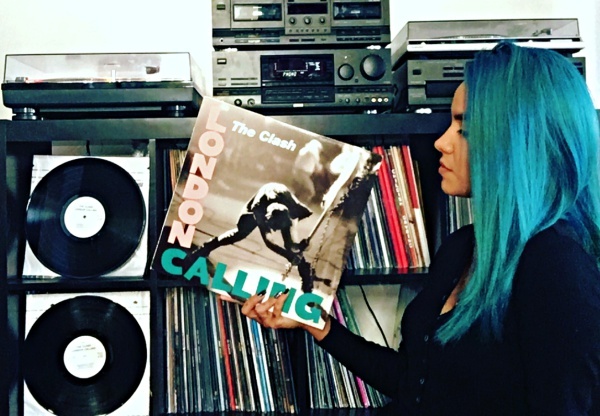 The Texas mother of two loves all kinds of different music genres, and her vinyl collection is a reflection of that open-mindedness. If you live in the El Paso area and frequent record stores, you might have seen Carolina and her family thumbing through the aisles, looking for their next wax discovery. It feels awesome to welcome Carolina to the site's Record Collector club. I've been collecting records for about three years now. Not that long ago, right? But if you look at my collection, it may seem as if I've been collecting for a while now. Music has always been a huge part of my life. I always felt like it was part of who I was, part of my personality, so when I found out about records, it just got out of control pretty fast. I've never been so passionate about something until I found this. It has taken over my home [laughs]. Even my daughters, who are 10 and 8, collect a little bit. It's a family trip for us to go to record shops on the weekends. We all just get lost in those crates for a little bit, get home, and enjoy our new pieces. It's the best and I'm so glad my kids are growing up with these memories. Just last night we were all jamming out to Outkast Stankonia [laughs]. It definitely brings us together. Music really is a huge part of our family. I prefer to buy at my local shops here in El Paso. I always look there first. My favorite shop is this little indie store in downtown called Atomic Wax. That's where I have always discovered new music. It's my favorite feeling in the world, by the way [laughs]. But if there is a specific record I've been looking for, I usually get it on Discogs or Amazon. Even accounts on IG that sell. There is a great community on there. The most has been $80 for Gorillaz Demon Days. I got it online and it was so worth it! I actually think I got it for a very good price. I have seen those go for $150, or even $200 for the original press. So, I was extremely happy for that! It had been on my wish list forever! My most prized record would have to be my 1993 Siamese Dream by Smashing Pumpkins. It's an original press on pale orange vinyl! That's a timeless record. It has everything that I love. First of all, it's from the era I fell in love with music: '90s rock. Billy Corgan's distinctive voice with lyrics that could spill your heart out...I'm a sucker for that. It's an incredible piece full of raw emotion. Not really, I'm still fairly new to the record community but everyone so far has been very welcoming and encouraging. I still have so much to learn but I'm having so much fun doing it. All I know is that I love music, love learning about it and what better way to do it then sharing my love for vinyl. Right now, it would have to be Jay-Z and Kanye West's Watch the Throne. My husband has been looking for that one for a while now, like a year maybe, but it's pretty pricey and they run out fast. I am also a huge fan of Cat Power, so I've been wanting her Sun album. The deluxe edition comes with so many little little surprises that I get really excited about. I'm also on the mission to own all of Chelsea Wolfe's albums on vinyl. So far I only have two but little by little. A lot of hip-hop albums are also on my wishlist, like Nas and Damian "Jr. Gong" Marley's Distant Relatives, The Low End Theory by A Tribe Called Quest, and the list goes on. Obviously, my taste in music is all over the place [laughs]. I don't have a preferred genre but there are some that hold a specially place in my heart for sure. As long as it makes me feel something, that's all I ask for. It's the best feeling in the world.